I am having some prob on a work piece, coating on part lower ID on the dimension which forms a "L" shape from cross section where coating on the whole L surface (vertical and parallel base of the "L"). 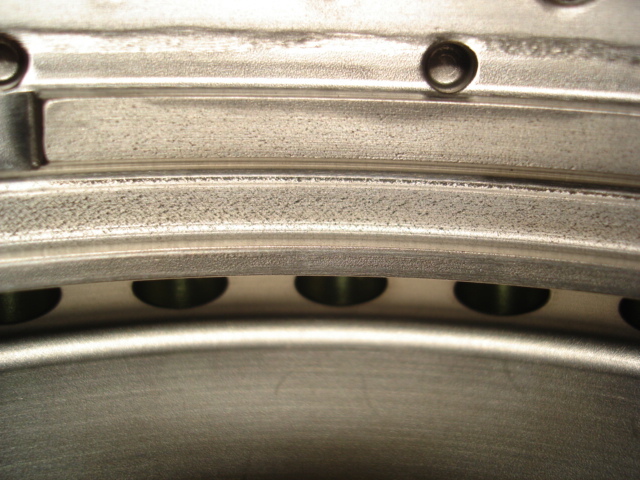 Porous surface finishing after final machining to limit. -Parameters is optimum when check on the test piece. -Thk build up @ ~ 0.012". -After machined coating thk on surface ~0.006"-0.008"
It should show very smooth and shiny surface after machine and not the "porous" like that. It is worse after the step on the vertical side. First, I think I would make up an L shape test piece to duplicate part surface, fit on component or simulate same conditions and spray. Do metallography on whole L shape cross-section to establish what's happening to the coating. 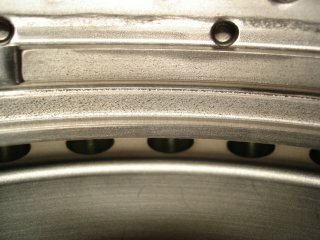 If coating looks good then you may need to concentrate on improving the machining/grinding procedure. ID spraying problems with ventilation of dust and debris away from coating area, but much worse than that is the L shape surface. Excuse my scribble, but I think you will get the picture When spraying one surface, spray material bouncing off will form a very poor quality secondary deposit on the adjacent perpendicular face. The only way I can suggest for curing this problem is to mask either the vertical or horizontal face and spray the other at the best angle you can get. Remove masking and spray again with optimal spray angle for uncoated area. One other thing to consider is your spray angle. Is it possible with your geometry to spray at 45°? The bottom of the 'L' looks to be more sound (what Gordon is calling the primary coating), and the back of the 'L' is hwere the porosity is forming. On this surface you are essentially spraying at a 30° angle and possibly causing peaks with the coating, which in turn creates pores behind these peaks relative to the spray direction. I have gotten a scrap work piece and will carry out a test by putting test pieces at both vertical & horizontal dimension and see the outcome. 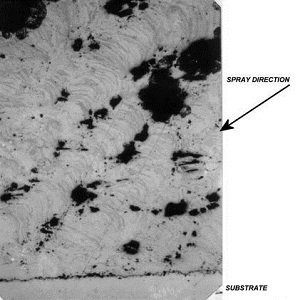 I agree with you on the rebounce and expected the angled spraying with rebounce will deteriorate the coating integrity. Masking this area and build up one surface follow by another seems right move. I will do both trial simultaneously. And shall get back to you on the outcome and improvement.